Catherine Lord, PhD, Michael Rutter, MD, FRS, Rhiannon J. Luyster, PhD, Katherine Gotham, PhD, et al. Software Upgrade Package (includes ADOS-2 Manual, 50 Protocol Booklets - 10 for each Module, Additional Toddler Module Stimulus Items - 15 items that when added to your existing ADOS Kit allow for Toddler Module administration, Unlimited-Use Scoring CD). Requires PC with Windows 10, 8, 7, Vista or XP. CD-ROM drive and USB port required. We provide a variety of training courses in ADOS-2 - visit this page to view upcoming courses. Like its predecessor, the ADOS, ADOS-2 is a semi-structured, standardised assessment of communication, social interaction, play, and restricted and repetitive behaviours. It presents various activities that elicit behaviours directly related to a diagnosis of ASD. By observing and coding these behaviours, the test user can obtain information that informs diagnosis, treatment planning, and educational placement. The ADOS-2 includes five modules, each requiring just 40 to 60 minutes to administer. The individual being evaluated is given only one module, selected on the basis of his or her expressive language level and chronological age. Following guidance provided in the manual, the test user chooses the module appropriate for the individual under evaluation. Toddler Module – for children between 12 and 30 months of age who do not consistently use phrase speech. Module 1 – for children 31 months and older who do not consistently use phrase speech. Module 2 – for children of any age who use phrase speech but are not verbally fluent. Module 3 – for verbally fluent children and young adolescents. Module 4 – for verbally fluent older adolescents and adults. Each ADOS-2 module has its own protocol booklet, which structures the administration and guides the user through the processes of coding and scoring. As test activities are administered, the test user observes the individual under examination and takes notes. Immediately afterwards, the test user codes the behaviours observed and then uses the Algorithm Form for scoring. In Modules 1 to 4, algorithm scores are compared with cut-off scores to provide one of three classifications: autism, autism spectrum, and non-spectrum. The difference between autism and autism spectrum classifications is one of severity, with the former indicating more pronounced symptoms. In the Toddler Module, algorithms provide ‘ranges of concern’ rather than classification scores. 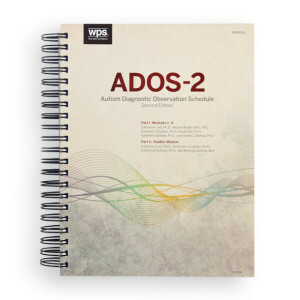 Administration and coding procedures for the ADOS-2 are functionally identical to those for the ADOS. Modules 1 to 4 retain the same basic activities and codes, though some codes have been expanded and several new codes have been added. Protocol booklets for these modules have been significantly improved and provide clear and explicit administration and coding instructions. In the ADOS-2, algorithms for Modules 1 to 3 have been revised to achieve more accurate and targeted results. These updated algorithms provide a more uniform basis for comparing results across the three modules that are used with children and young adolescents. A new comparison score for Modules 1 to 3 allows the test user to compare a child's overall level of autism spectrum-related symptoms to that of children diagnosed with ASD who are the same age and have similar language skills. This score also makes it easier to monitor an individual's symptoms over time. The comparison score is a continuous metric, ranging from 1 to 10. However, to facilitate clinical interpretation it can also be expressed as one of four descriptive categories – from ‘no evidence of autism spectrum-related symptoms’ to ‘a high level of autism spectrum-related symptoms’. The new ADOS-2 scoring program helps the test user to choose the correct algorithm, converts item codes to algorithm scores, adds up the algorithm, calculates the comparison score and quickly arrives at an ADOS-2 classification or ‘range of concern’. The Toddler Module engages the child with loosely structured activities involving highly motivating materials. The goal is to see if the child demonstrates behaviours associated with ASD. As in Modules 1 to 4, observations are coded immediately following administration, and the codes are converted to algorithm scores. However, Toddler Module algorithms provide ‘ranges of concern’ rather than cut-off scores. These ranges help the test user to form clinical impressions, but avoid formal classification – which may not be appropriate at such a young age. The Toddler Module quantifies risk for ASD and signals the need for continued monitoring. With improved algorithms, the ADOS-2 demonstrates strong predictive validity. It provides a highly accurate picture of current ASD-related symptoms, based on real-time observations. Physicians, clinical psychologists, school psychologists, speech-language pathologists and occupational therapists use ADOS-2 results to inform diagnosis, intervention, educational placement and treatment planning. 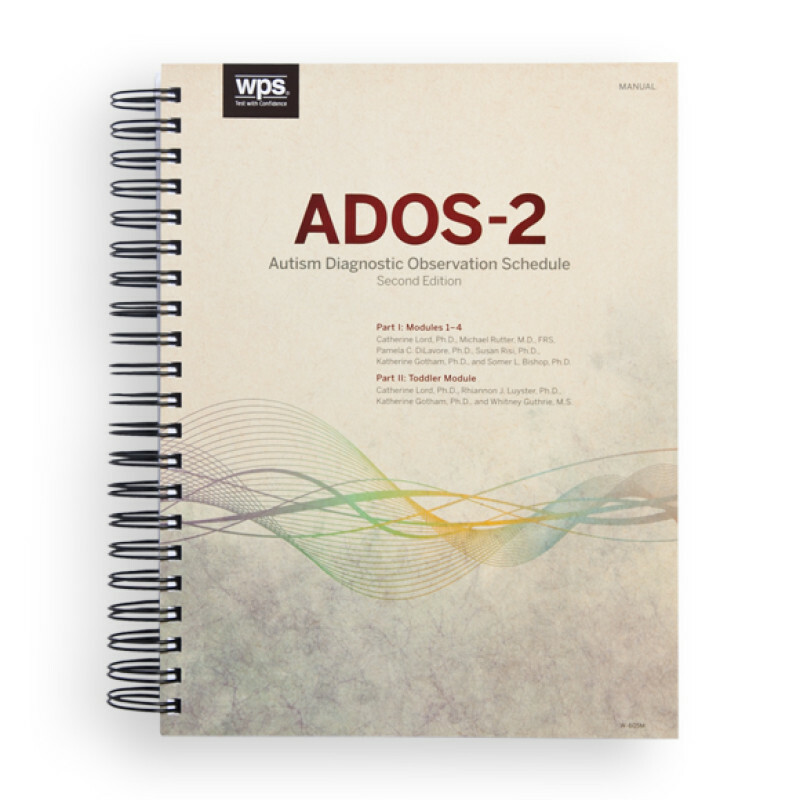 ADOS-2 can be used with a wide range of children and adults in any hospital, clinic or school that serves individuals with developmental disorders.